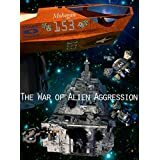 "The War of Alien Aggression by A.D. Bloom is a great collection of sci-fi books about humanity's war against the Squidies and the hardships that follow. It contains all five volumes in the series, which totals over 500 pages. Bloom writes about the Hardway and Privateer Admiral Harry Cozen with the evident flair of a sci-fi writer. The books are quick and fast-paced, with twists and turns at every corner, but Bloom does not forget to flesh out his characters so that you can feel like you are in their shoes. If you're looking for a sci-fi book that will remind you of TV shows like Battlestar Galatica, The War of Alien Aggression is a perfect fit." Please enter your email address and click the Follow button to follow A.D. Bloom! Lost Dogs and Monsters (the kaiju queen) 22nd century biopunk sci-fi featuring rogue geneticists, thumbed canine assassins, and giant monsters of Royal North Korea.